There are many myths attached to the tuning of modern helicopter engines and also many preferred tuning methods based on the type of work they are to do. Through simply watching and listening to your engine during a flight and understanding some of the signs of poor engine tune, you can apply your new found knowledge to whatever situation you like, and make the model work at its best without compromise. To do this it is important to appreciate what each needle is actually controlling on your engine throughout each flight and what to listen and look for. 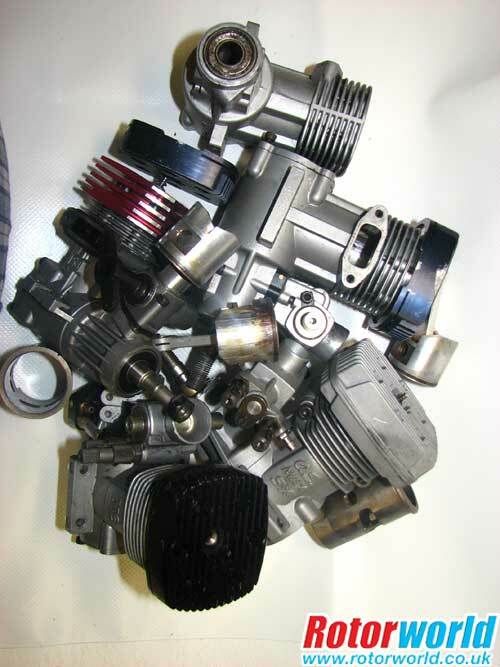 Modern model helicopter engines generally have a short break-in period, however this period is critical to how well your engine will perform over time. Fast inappropriate break-in periods can lead to an overall reduced engine life and may hamper peak performance from the start. Bench running is not usually required for these engines as this will require re-tuning when placed into the running conditions of a helicopter anyway. Initial engine runs should always be at the factory settings as outlined in the engines manual, which will change from manufacturer to manufacturer but will always provide for safe needle settings to start your engine and run without damage. It is not necessary or desirable to further richen these factory settings for breaking-in as cold runs on an engine can almost be as damaging as lean runs. 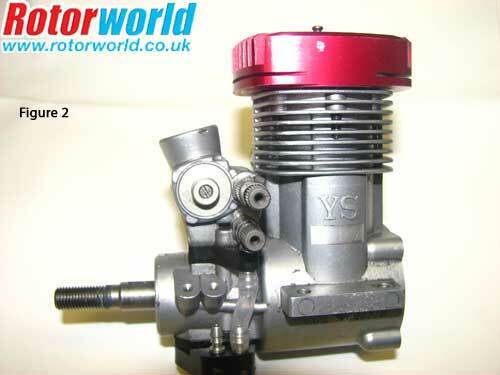 The engine components are designed, manufactured and fitted so they will perform best at temperature. Running cold to the touch means you will run the engine outside specification which may damage moving parts from the beginning. In terms of engine breaking-in during flight, lowering the running speed of the engine by a few hundred rpm is advisable for the first few flights, with devices such as engine governors, if fitted, being deactivated. During a typical breaking in flight, try to avoid long periods of hovering, but rather work the engine lightly with gentle loops and rolls as this works the engines rpm band, varying load and temperature as it does. The average 30 – 50 engine will require factory needle settings for the first tank or two after which they will benefit from slightly leaner settings. Engines of 60 – 90 size will benefit from a slightly longer factory needle setting period and will require much finer leaning of the needles over a longer period. Both sets of engines will continue to break-in over the next few gallons of use and will improve in terms of power over the course of those gallons even without further needle adjustments. With the breaking in period largely over, attention turns to tuning the engine for normal everyday flight. 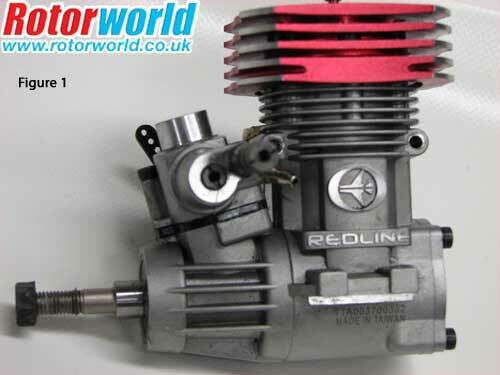 The aim here is to try to achieve a smooth and powerful engine which will allow you to extract the most from your model without reducing the natural lifespan of your engine. All of these things can be achieved by taking a little extra care in the beginning when setting up your engine. Firstly it is important to acknowledge what is actually happening to your engine when you tweak those needles, what to watch out for and where to begin. 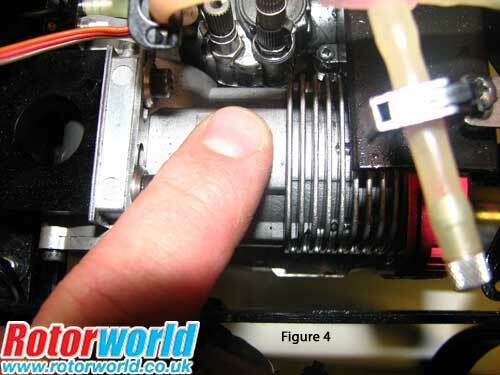 Whether your engine has a two or three needle carburettor it will always have a low end needle, see Figures 1 and 2. 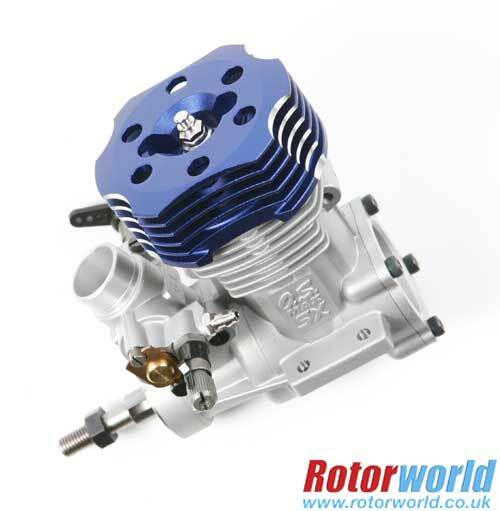 Whatever the make or model of engine you have, this needle will control both the idle and also the throttle transition from low to either mid or high depending on the number of needles on your carburettor. So how do we set this needle? The idle of the engine will be a good starting point for this needle which will essentially act independently of the main needle when the engine is at tick over. From the factory setting start the engine, which should fire after a few turns of the starter, and allow the engine to sit without the clutch grabbing and see what it does. It should idle with a clearly smooth and constant engine tone without sounding harsh or lumpy and without engaging the clutch at all. If the engine wants to idle at quite a high rpm and cannot idle at all when the throttle trim is reduced to compensate, thus engaging the clutch, then the mixture is too lean. On the other hand if the engine does not want to idle or idles periodically and then cuts and proves difficult to restart then chances are the low mixture is too rich. This condition could possibly be backed up with excess unburnt fuel coming from the carburettor or exhaust. Adjust the mixture accordingly depending on the condition from before and attempt to settle the engine into a smooth idle. Upon achieving a reasonable idle a simple test can be used to check the accuracy of the low end mixture. 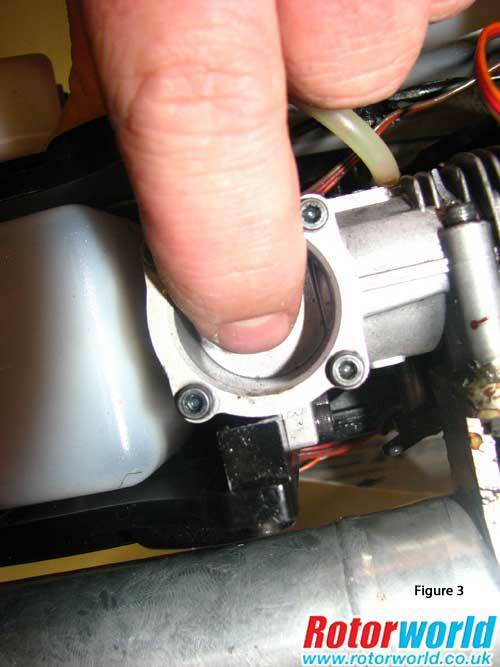 With the engine at an idle, pinch the fuel feed close to the carburettor and observe how the engine reacts. If the engine idles only a few seconds and then cuts you know the mixture is tending towards the lean end. If when pinched the engine runs, for longer than approximately eight seconds, then the mixture is tending towards a rich setting. For normal flight a setting within this band will prove adequate although it is advisable to stay to the rich side as long as the idle remains constant. Note the phrasing of that last sentence ‘for normal flight’. Further adjustment of the carburettor will be required for more extreme flight conditions which will be discussed later. The much larger high end needle can be seen as the master flood gate for the fuel supply to your engine. Large adjustments on this needle will have a very noticeable effect on your engine which are easy and clear to observe, if you know what to look for. On a two needle carburettor this needle will be the main area for adjustment in a normal days flying. It is important at this point to also dispel a tuning myth to help understand how the high end needle works. Often you may hear pilots refer to their engines as being ‘leaned in’ for maximum power and in a situation where they know this is at the expense of engine life, with their engines often being changed out for new ones on a regular basis. This is often the claim with competition pilots who put up large numbers of flights in a season and have engines which are said to be worn out from over use. After many hundreds of very hard flights it may indeed become the case that an engine will lose its power edge but this will be simply an edge and swapping out several engines in a single season regardless of how many hard flights they have had is simply a sign of poor tune. Model helicopter engines produce their maximum power within a certain tuning band, mostly controlled by the high end needle. Within this band of tune the engines pulling power will remain virtually the same between the maximum lean and maximum rich positions (which may be a few clicks either side of the band centre) however at the fully lean setting the engine is wearing at a much higher rate due to the relative lack of fuel excess under heavy load. Therefore over the course of several gallons at this type of setting the engine will have worn at a much faster rate than if it were running at the richer setting of the power band but with little or no actual power advantage. The point being made here is that leaning the high end needle on any model engine will produce more power to a certain point, beyond which the power will stay the same but the wear rate will increase. An engine can only produce its maximum rated power and it can’t be made to produce any more no matter what you do. There are a couple of very simple ways of testing this needle for tune in flight, which will clearly let you know when it is not set right. One important rule when setting the high end is that is must only be tuned for maximum power when the engine is up to temperature. Adjusting the high end mixture when the engine is cold can often lead to mixture problems later in the flight and can, when taken to extremes, damage the engine. So assuming the needle is not far from factory settings, flight testing of the high end needle can begin. After a brief period warming the engine, with the needle at factory settings or there abouts, test the helicopters ability in a full power climbout. Assuming the helicopter is pulling a reasonable amount of collective pitch the ideal condition is the helicopter pulling away at a consistent power with a constant trail of smoke from the exhaust. It is likely that the engine will be rich at this point, so lean it in a click or two and try again. Continue this procedure until you notice either the rate of climb beginning to slow or the smoke from the exhaust reducing. At this point the engine is leaning under load and therefore heating up and you should richen the high end needle for further tests to eliminate this condition. If you have the engine close to where you want it, you can fine tune the needle setting by observing what happens to the engine during an autorotation. Again do your full power climbout and when you are at a comfortable altitude flick the throttle hold and begin an autorotation whilst listening to the engine. If the engine rpm ‘hangs’ at a higher level than the set throttle hold/idle point for several seconds then the mixture is tending towards the lean setting. The ideal condition is to do exactly as before but this time when the throttle hold switch is flicked the engine settles down to an immediate and steady idle as preset on your throttle hold. Any sign of the engine rpm hanging during an autorotation or even perhaps a harsh sound from the engine as the auto begins is a sign of leaning and should be dealt with by richening the high end needle to eliminate. Now that you have set your engine to where you believe to be the optimum tune there are a couple of ways to confirm this by looking at your engine, as the dreaded lean runs always leave their mark. The first port of call should be to hand check the temperature of your engine. Hand checking rules of thumb are very useful as it is not often feasible to have a temperature gun to hand. Often with cooling shrouds, frames etc it is difficult to actually reach your engine head but there are two places that are normally quite accessible. The first place is at the bottom of the engine up inside the crank case cover. After a reasonable flight, quickly land and check the temperature at this point with your finger, see Figure 3. If you can hold your finger at this point for four to five seconds without being uncomfortable then the temperature is fine. If it begins to hurt then you are on the hot side and should consider running a click or two richer on the top end needle. The other place to check which will be hotter is on the side wall of the engine just below the combustion chamber, see Figure 4. If you touch this and it is immediately too hot to touch then you are running too lean. A couple of seconds only at this point will be reasonable for temperature. Another tell tale check for lean runs is to check the condition of your glow plug. Look at Figure 5, which shows a new clean plug and a well used lean run plug. 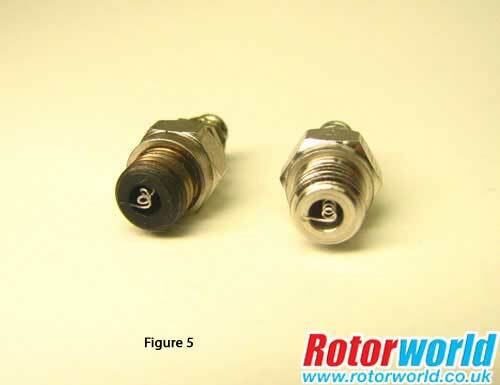 If you compare the two you will firstly see that the well used plug is darkened around the base, which in itself is not unusual, however if you look at the glow plug coil you will see that it is firstly tarnished and dull but also that the coil is misshapen and not in a nice straight coil as a spring would be. This plug has evidence firstly of a lot of use but also evidence of lean runs given the shape and colour of the coil. Well used plugs may exhibit a similar look after a lot of use (as glow plugs will have a finite life no matter how you treat them) but if your plug is beginning to look like this after few flights or even a gallon of two then you have been running lean at some point. Engine idle too high even when trim is reduced – Low end needle set too lean, needs to be richened. Engine won’t idle and stops proving hard to restart – Low end needle set to rich needs to be leaned. 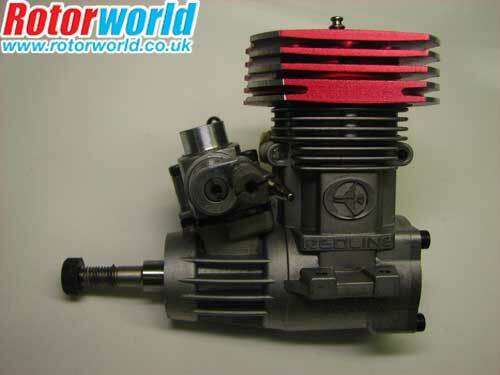 Engine rpm hangs during autorotations – High end needle set too lean needs to be richened. Engine cuts during bailed out autorotations – High end needle set too rich needs to be leaned.